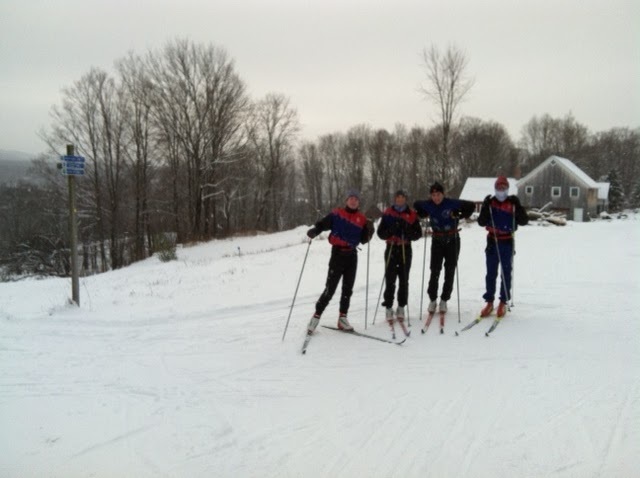 Getting to Craftsbury, we found a very chilling morning and a steady snow fall that lasted through the car trip there. At our 9:00 AM arrival, the place was bustling with junior teams, French-speaking teams from Orford, and UVM skiers. The thermometer read a chilly 18° on arriving, warming to 20° by the time we finished skiing. We got to our Classic boots and skis first, putting 3-4 coatings of a Blue Extra that corked in well and went to the trails. Most trails were open with fresh snow on them. It was very excellent skiing with minimal or no sightings of grass. We took the Men’s Sprint Loop several times. It was awkward being out there for the first time on skis, and I’m sure we all had at least one slip that we can admit to. The Extra Blue kept a wax pocket notably, though it did get slippery after the first hour. We then took off our poles to work on some classic technique on the tiny lower stadium loop. It became clear after an hour or so of skiing that about half the New England ski community was bustling around the Craftsbury trails. UVM was doing some pretty hard intervals, while some were shooting on the one new biathlon target in the lower stadium. After no-poling we took an easy tour out into the field where the Craftsbury Green Team house is, and into the winter wonderland of trees below. We hooked onto the 5k race course and some of us reminisced about the last Eastern Cup race there last year. We then took an extended snack break and Tucker, Colin, and Chris skated for a half hour while Noah kept classic skiing. Overall, the four boys felt great to finally put on our skis again. Now all we need is some accumulation in the Upper Valley!